Home / News / If The Stock Market Does Crash After Brexit, What Will Happen To Gold Prices? Historically gold prices have increased when there have been falls in stocks and shares but this has not always been the case, writes Oliver Temple. Cast your mind back to the big economic crash of 2008. Gold prices – and this is why some may still feel cautious about the metal – did not react straightway. Many assumed investors would be turning to gold as a way to hedge against any loses. In fact, what happened was that gold initially edged up by only 5%. However, as it began clearer that Britain was entering a dark economic period, prices for the metal then went onto climb by 25% over an 18th month period. So should investors rush into gold if a crash does happen? Like any other commodity, the metal is governed by market forces. Even if the stock market did crash we would not necessarily see a huge demand for gold. The strength of the US dollar, for instance, has a strong bearing on the metal in Britain as I have reported recently. So let’s say the dollar is able to weather a UK stock market crash, it’s possible that investors in the US would not immediately turn to the metal. The reason is that they may feel there would still be better returns away from gold. This would have a knock-on effect on UK gold prices. 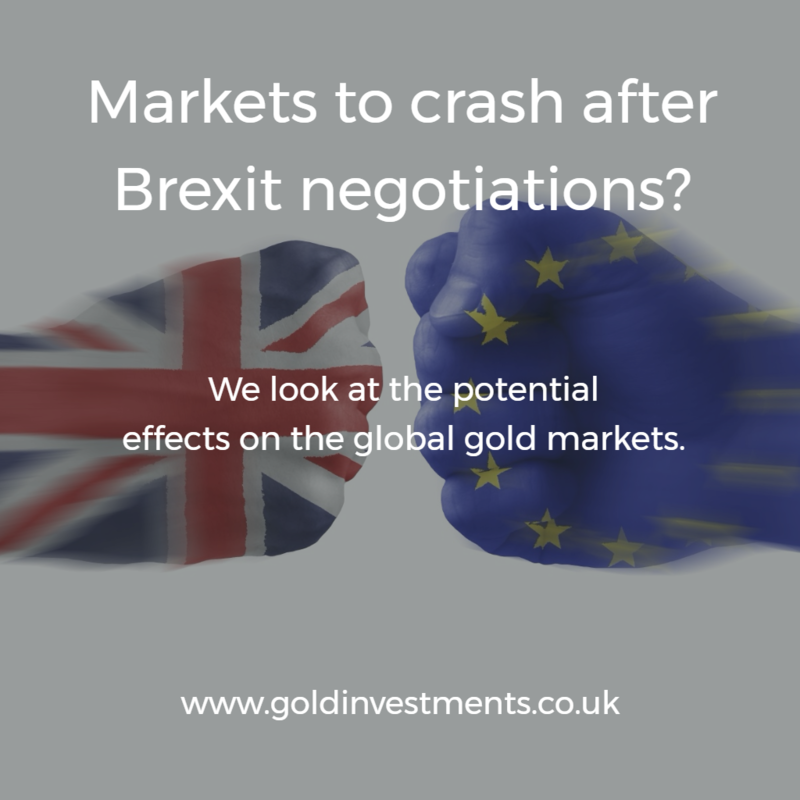 However, if there was to be another UK Election following a crash or some major change such as Britain not leaving the EU in the end, we would expect a rapid increase in gold demand in this country. This is what happened not only after this year’s snap Election result but also after the EU referendum. We specialise in the UK Asian market and see a growing interest for the metal particularly around key festival times such as Diwali. The key take away message is not to assume that there gold prices will necessary soar even if there is a UK stock market crash. There are many factors that affect gold prices such as the strength of the US dollar. What we would advise against is buying gold for the short-term which can be a highly risky strategy. Our view is to look at purchasing the metal for the medium to long-term. We would also suggest that gold should make up no more than 15% of an investment portfolio. Buying physical gold from Gold Investments is very straightforward to do. We offer a wide range of quality gold bars and gold coins – often at the lowest prices on the market. We’re also able to store securely gold at our vaults at the London Silver Vaults at low prices. Many of our clients like our friendly and knowledgeable approach. Please do get in touch and let’s have a chat over a coffee (please make an appointment first) at our City offices.